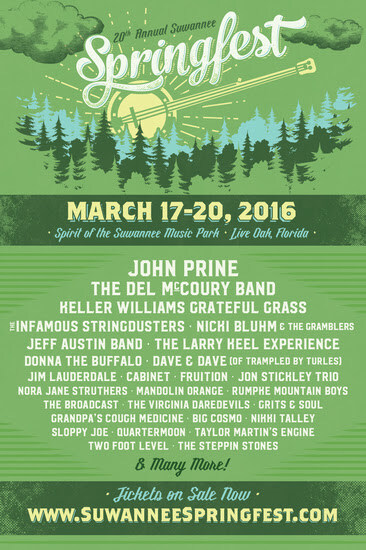 Live Oak, FL — Suwannee Springfest celebrates 20 years of kicking off the spring festival season at the beautifulSpirit of Suwannee Music Park in Live Oak, FL. It takes place March 17-20, 2016 and we are thrilled to announce that John Prine will be headlining the festival with his debut appearance at the event! A lot of return favorites from over the years will be joining in to help celebrate the anniversary including The Del McCoury Band, Keller Williams Grateful Grass, The Infamous Stringdusters, Jeff Austin Band, The Larry Keel Experience, Donna the Buffalo, and Jim Lauderdale. Nicki Bluhm & the Gramblers and Dave & Dave (of Trampled By Turtles) make their debut appearance at the fest! Other fun acts on the bill include Cabinet, Fruition, Jon Stickley Trio, Nora Jane Struthers, Mandolin Orange,Rumpke Mountain Boys and more. Stay tuned for additional artist announcements, workshops, and other activities! See the full lineup at suwanneespringfest.com. Attendees can reserve RV hook ups, cabin rentals, and golf cart rentals by calling the park. SOSMP is located between Jacksonville, Florida & Tallahassee, Florida about 30 minutes south of the Georgia State line, about 45 minutes north of Gainesville and is host to a variety of events. Please visit the park’s web site atwww.musicliveshere.com or call them at 386-364-1683 for information. Further information at suwanneespringfest.com. Also visit us on at facebook.com/suwanneespringfest,twitter.com/SuwanneeSpring and instagram.com/SuwanneeSpringfest. This entry was posted in Festivals, Just Announced and tagged Bluegrass, Cabinet, Concert, Del McCoury, Festival, Festival Season, FL, Florida, Fruition, Grateful Grass, Jeff Austin, Keller Williams, Larry Keel, Live Oak, Music Festival, Springfest.